14 lb Practice Smoked Turkey - No matter how many times you smoke/cook a turkey it's always helpful to practice and verify your plans before that big Thanksgiving meal with family and friends. Not only did I use this cook for practice but it also emptied my freezer of those great priced turkeys available around the holidays. Most grocery stores practically give those gobblers away in order to get you inside their doors. I usually grab 3 to 4 Foster Farms Fresh Young Turkey 14 pound turkeys at Costco (usually ~ 99¢ / lb) . I'll smoke one and freeze the rest to enjoy every few months during the year. Unlike what people think smoking a turkey is one of the easiest cooks to make. Many people will just season inside the cavity and on the skin before placing the bird into the pit. I, on the other hand, advocate not only seasoning inside the cavity and on top of the skin but also under the skin. Not seasoning the turkey under the skin keeps all those wonderful flavors from enhancing the turkey meat. Brining never hurts although most commercially bought turkey have already been enhanced with a sodium solution. 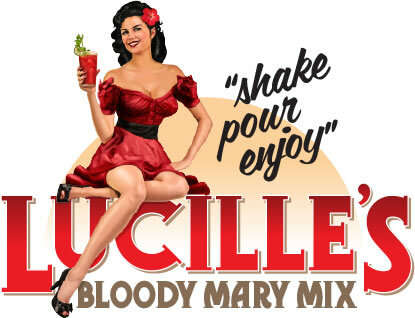 I prefer to rub extra virgin olive oil on and under the skin before seasoning on and under the skin with a combination of McCormick Montreal Chicken Seasoning and Smoker Pete's Western Rub. The combination of spices are superb!! Wrap the seasoned turkey in plastic wrap and refrigerate for 4 or more hours - even overnight if you wish. This will allow the seasonings to work their magic on the turkey meat. In order to capture the drippings for gravy and keep the inside of my MAK 2 Star wood pellet smoker-grill clean I like to place the turkey on a Non-Stick "V" Rack inside a large aluminum pan. 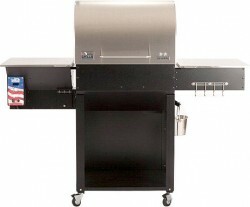 Preheat your wood pellet smoker-grill to 230ºF using cookinpellets.com Premium Perfect Mix. 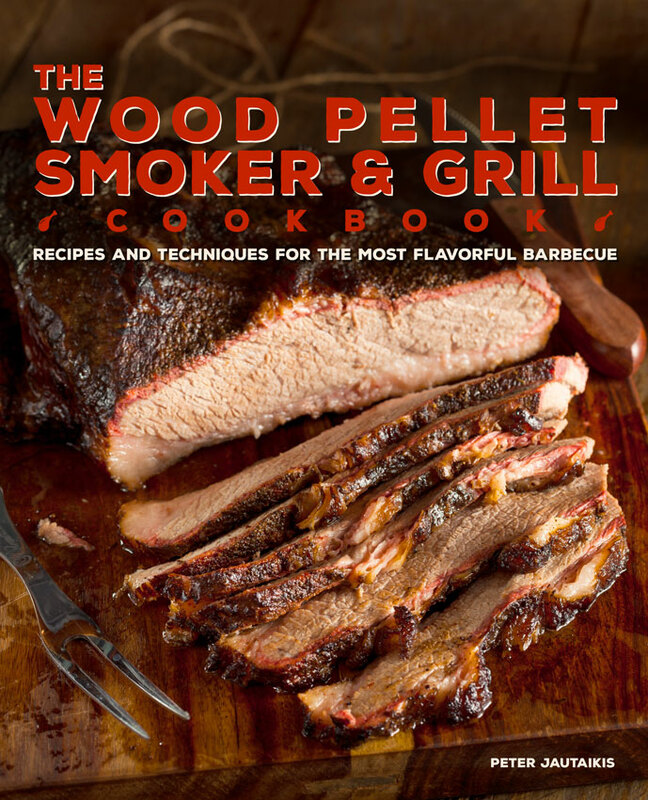 The Perfect Mix is composed of Hickory, Cherry, Hard Maple, and Apple pellets. You'll love the results! 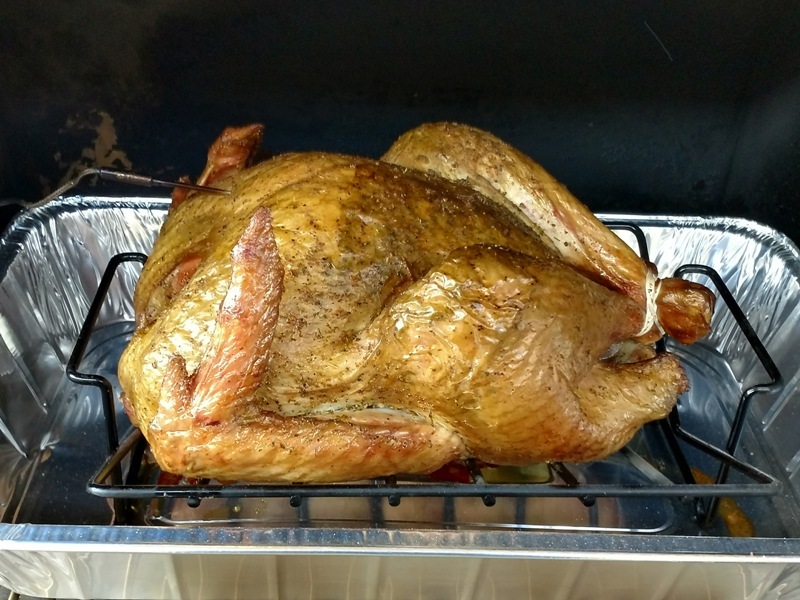 Smoke the turkey for 3 hours at 230ºF before increasing the pit temperature to 325ºF. Finish cooking the turkey until the thickest part of the breast reaches an internal temperature of 170ºF. Rest the smoked turkey for 20 minutes loosely under a foil tent before carving. You can never eat too much turkey!! Looks delicious Pete! I’ll have to try your smoked turkey recipe. Looks pretty awesome as always!! How long would you say it took you to finish it? It took about 1½ hours from the time I bumped the pit temp to 325ºF. I keep notes on every cook in a small notebook so that I have something to refer to when I’m planning a meal. I turned my pellet grill ON at 11:30 am. 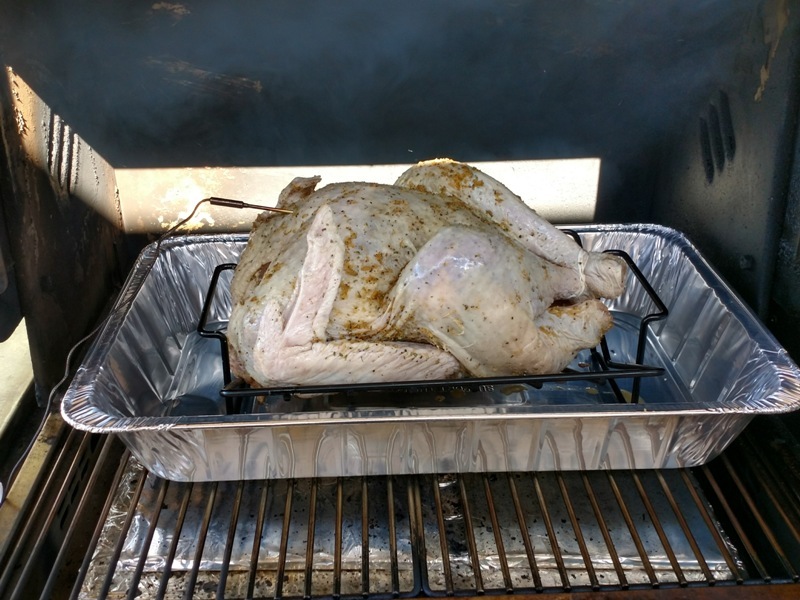 Placed the bird IN at Noon and smoked the turkey for 3 hours. At 3 pm bumped to temp to 325ºF and at 4:30 pm the internal temp at the thickest part of the breast reached 170ºF. 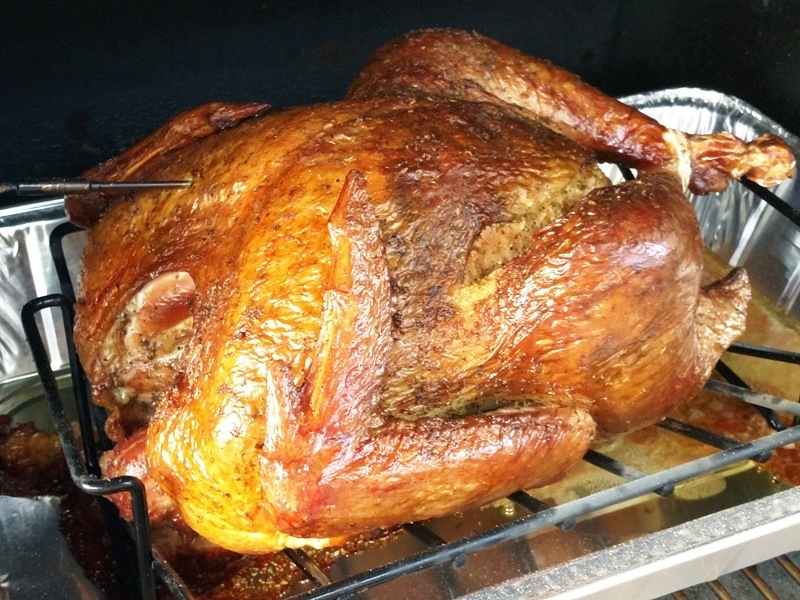 Rested the smoked turkey for 20 minutes, carved and served … Remember that these numbers are for a 14 lb turkey.